1. Baptists: Who? Where? What? Why? 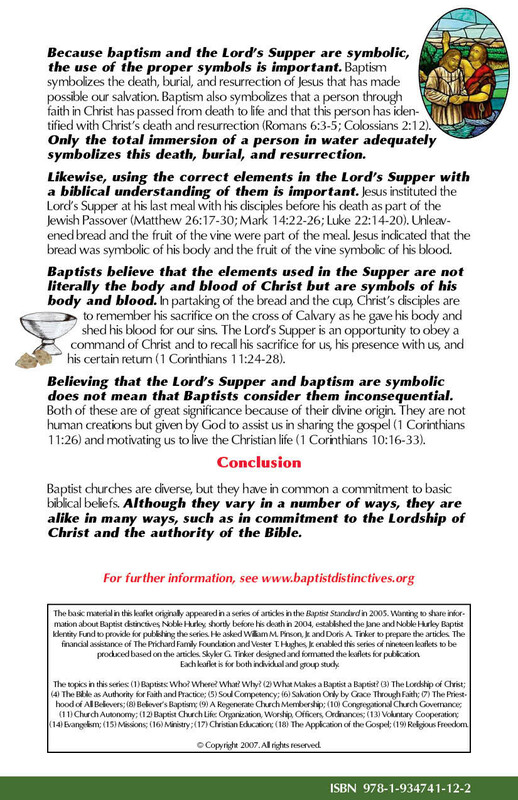 presents a brief overview of the Baptist family of Christians. 2. Baptists: What Makes a Baptist a Baptist? emphasizes that no single doctrine defines Baptists but rather a combination of beliefs (the “Baptist Recipe”) makes Baptists a distinct Christian denomination. 3. 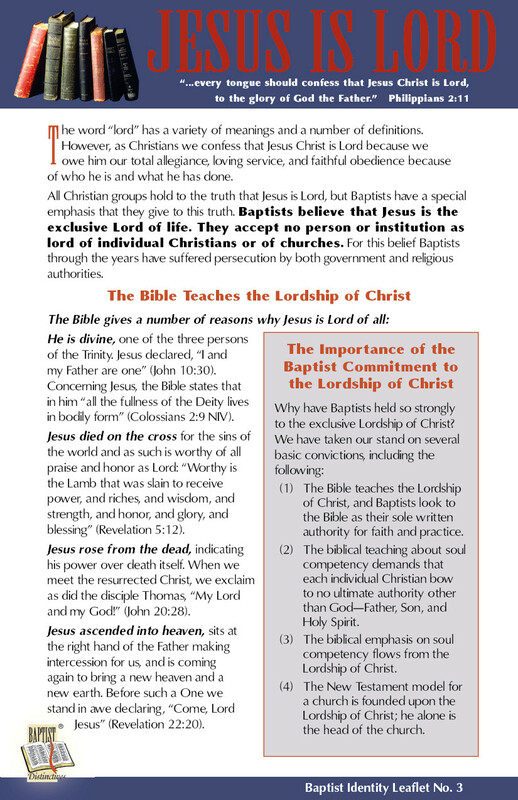 Jesus Is Lord sets forth the importance of the Lordship of Christ, the biblical basis for the doctrine of the Lordship of Christ, and the relation of the Lordship of Christ to other Baptist beliefs. 4. 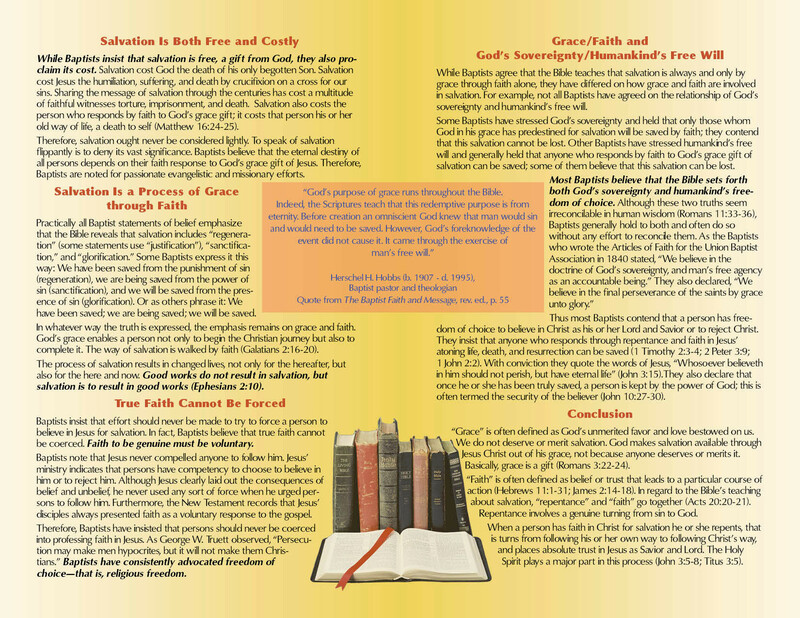 The Authority of the Bible states why Baptists believe that the Bible is the sole ultimate written authority for Christian faith and practice. 5. Is Soul Competency THE Baptist Distinctive? discusses the meaning of soul competency and how it relates to other beliefs important to Baptists. 6. 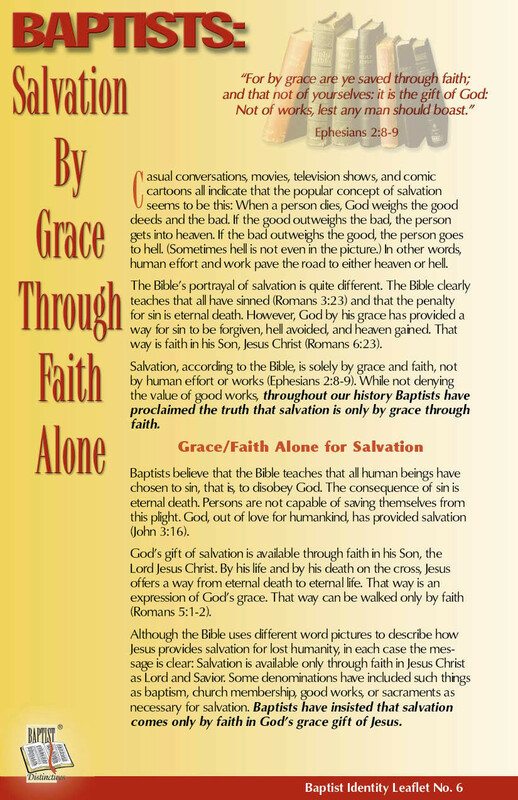 Baptists: Salvation By Grace Through Faith Alone emphasizes that salvation is possible only through God’s grace and briefly discusses the relation of God’s sovereignty and humankind’s free will. 7. 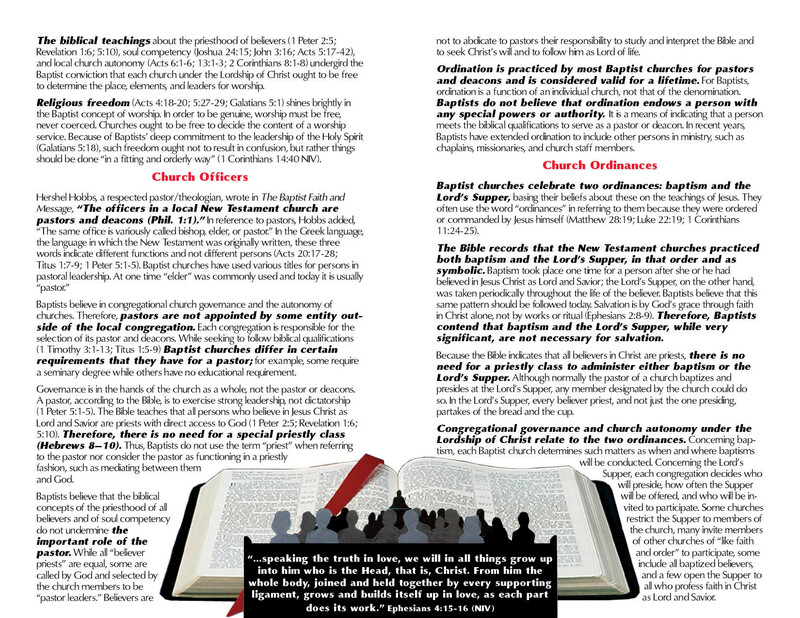 Baptists: The Priesthood of the Believer or of Believers? describes the biblical basis for the priesthood of all believers and the relation of individual believers to the community of believer priests. 8. 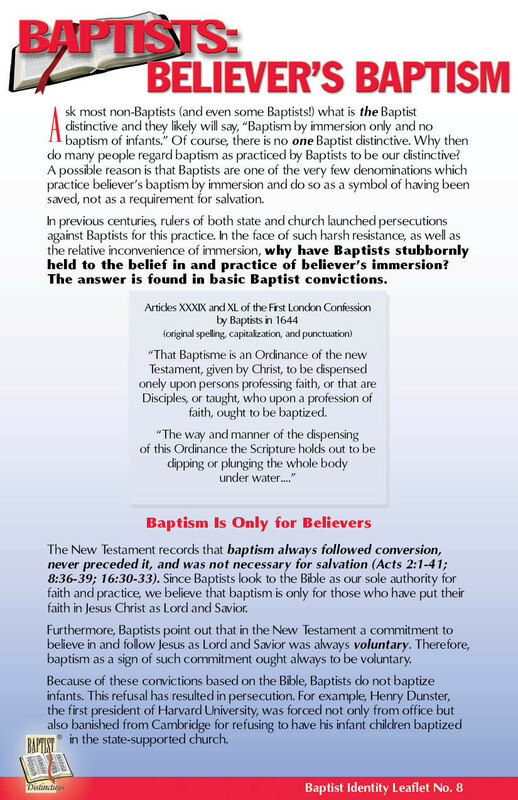 Baptists: Believer’s Baptism provides the biblical basis for Baptists’ belief that baptism is only for believers and only by immersion. 9. Baptists Believe in a Regenerate Church Membership discusses why only persons who have been born-again should be members of a church as well as why born-again persons should be members. 10. 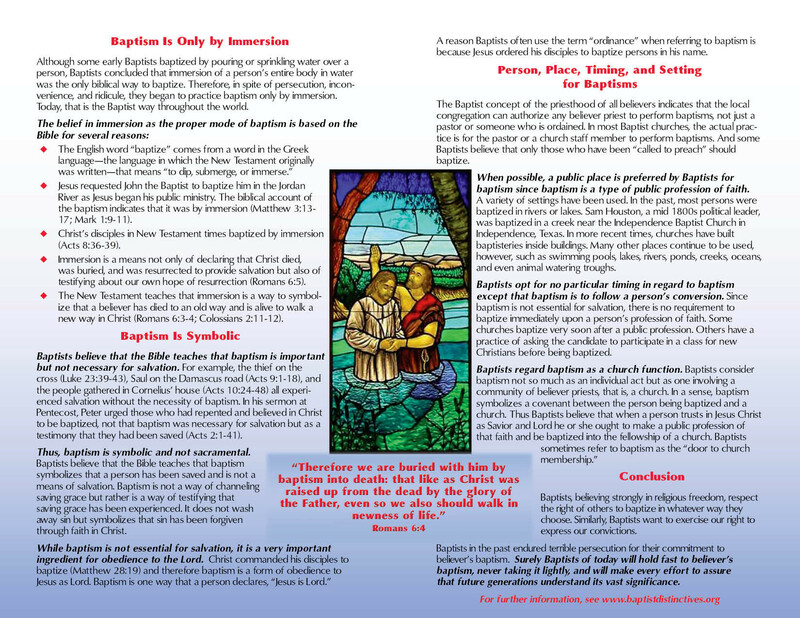 Congregational Church Governance sets forth the biblical basis for the Baptist conviction that each congregation of baptized believers should govern itself under the Lordship of Christ. 11. 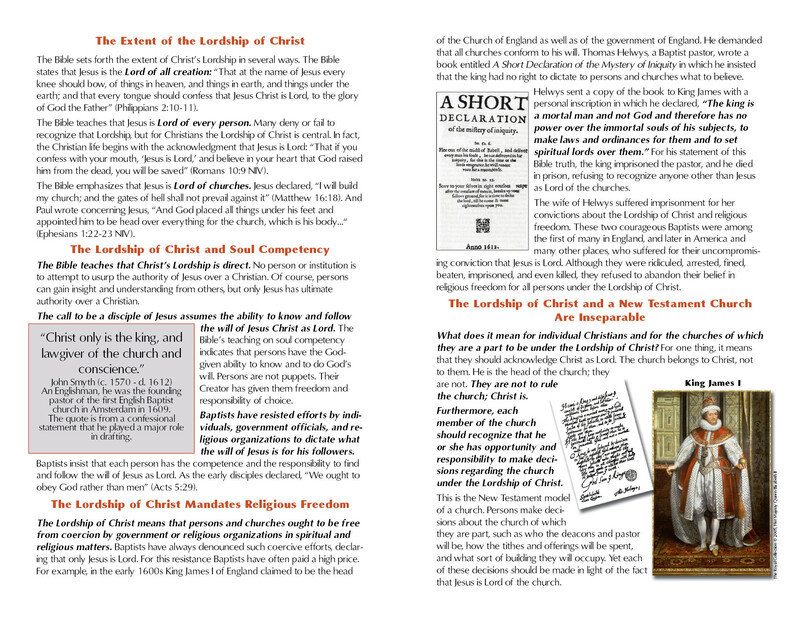 Baptist Autonomy: Difficulties and Benefits explains the basis for the belief that each church should be an autonomous, self-governing body of baptized believers under the Lordship of Christ. 12. 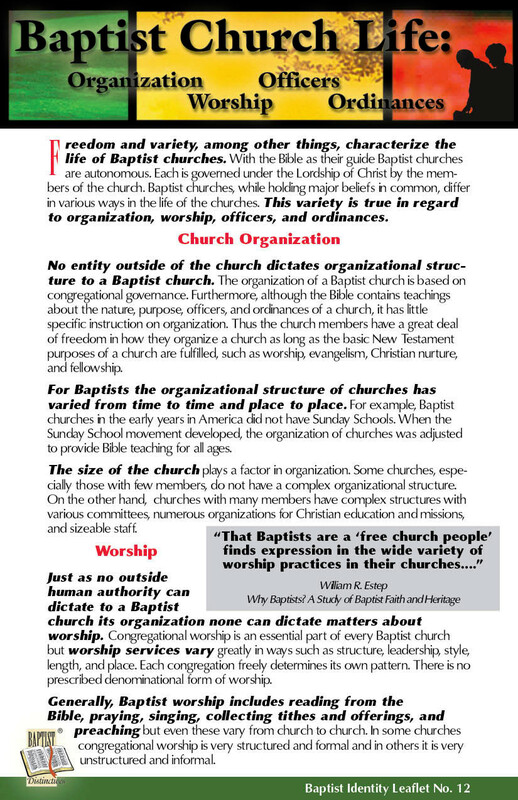 Baptist Church Life: Organization, Officers, Worship, Ordinances briefly discusses the ways that Baptist churches are organized and function in accord with the examples of New Testament churches. 13. Baptists and Voluntary Cooperation explains how Baptist churches work together voluntarily to carry out the Great Commission and the Great Commandment without giving up church autonomy. 14. Baptists and Evangelism emphasizes that sharing the Good News about Jesus Christ is every Christian’s opportunity and responsibility and indicates how Baptists function evangelistically. 15. Baptists and Missions explains the relationship of evangelism and missions and how Baptists endeavor to fulfill the missionary mandate of Jesus Christ to go unto all the world with the Good News. 16. Baptists and Ministry sets forth the biblical basis and guidelines for ministry by Baptists to the total needs of persons, such as spiritual, physical, mental, emotional, and social. 17. 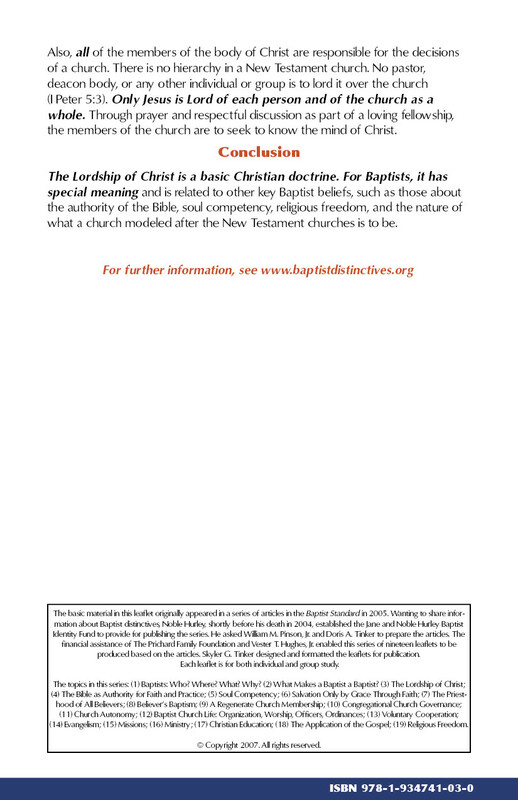 Baptists and Christian Education indicates why Baptists believe in making Christian education available for all persons and how they deliver it in a multitude of ways. 18. Baptists: Applying the Gospel describes why Baptists believe that the Bible teaches that Christians have a responsibility both to verbally share the gospel and to apply it to all of life. 19. Baptists: Champions of Religious Freedom tells why and how Baptists have been leaders in the struggle for religious freedom and its relation to other beliefs precious to Baptist Christians.